The YX12 delivers outstanding performance in a highly versatile full range loudspeaker. Engineered in North America, the YX12 benefits from Yorkvilles forty plus years of PA enclosure design experience in the creation of this compact general-purpose passive loudspeaker enclosure. 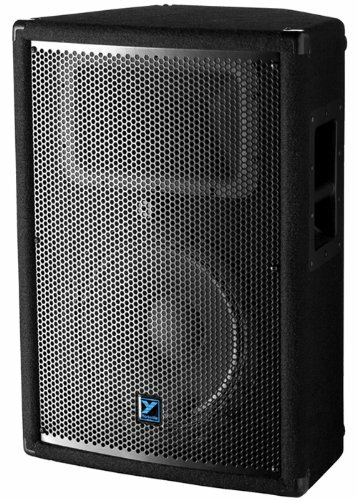 The YX12 cabinet uses a single 12-inch driver and an injection molded 90 x 40 degree horn with 1-inch throat and 1.4-inch Celestion neodymium compression driver. Yorkvilles tried and true dual-bulb CTL protection system protects the horn drivers aluminum diaphragm ensuring unmatched reliability in the field. The YX12 is built road-ready with easy-to-clean, durable black carpet covering, solid internal plywood bracing and reinforced internal component mounts. Designed with working musicians in mind, the YX12 offers rugged 5/8-inch plywood cabinet construction, all metal bar handles, metal input plate, integrated speaker mounts and a custom punched, perforated metal grille to protect the speaker components. A modified trapezoidal shape ensures the YX12 can function equally as well as a front-of-house or monitor speaker. 1.4-inch Aluminum Diaphragm Horn Driver 1-inch Exit. Designed as Front-of-house or Monitor Loudspeaker. If you have any questions about this product by Yorkville, contact us by completing and submitting the form below. If you are looking for a specif part number, please include it with your message.